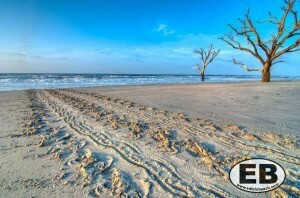 One of the most beautiful aspects of Edisto Beach is that both locals and visitors are committed to keeping it as natural as possible. That means the community knows that working together to ensure that Edisto Beach remains the same for generations to come is a worthwhile task. One thing that Edistonians and vacationers are truly dedicated to is protecting the Loggerhead sea turtles. The endangered turtles are protected by local, state and federal laws. While it may seem as though protecting the turtles is a complicated task, it is as easy as flipping a switch.  From May 1 to Oct 31 all lights on front beach must be turned off. This is to protect the hatchlings that could confuse artificial light for moonlight and not make it into the water upon hatching. This includes flashlights.  Any indoor lights that are visible on the beach should be turned off or covered with drapes.  Never attempt to help a sea turtle or hatchlings. Never move turtle eggs.  Fill in any holes dug on the beach or sand castle moats. These act as obstacles to sea turtles that nest on the beach and could trap hatchlings as they crawl into the water.  Pick up any litter found on the beach. Also be sure to take back any items brought to the beach including beach chairs, umbrellas, toys, and tents. All tents must be taken down at the end of the day.  Do not allow dogs to destroy or dig near turtle nests.  Call Edisto Beach Town Hall at 843-869-2505 extension 212 or Brad Drawdy at 843-631-0121 to report any sea turtle problems or strandings. While sea turtles nest on Edisto Beach all the time, many visitors never get a chance to see it happen. If you do get a chance to see a sea turtle make her way up the beach to nest, do not get too close and do not disturb the turtle. Do not take photos as the flash could cause the turtle to abandon her efforts and drop her clutch (eggs) into the water. Do not use flashlights to get a better look. It is best to just observe from afar. (All of the same rules apply when it comes to sea turtle hatchlings).